Earlier known as UberCab, Uber started in 2009 with the aim of evolving the ground transport services. The founders, Travis Kalanick and Garrett Camp, were both entrepreneurs before they started Uber. Travis co-founded StumbleUpon and Garrett founded Red Swoosh which he later sold at $19 million. As we all know Uber is an on-demand taxi booking services which is operated through an app. The term ‘Uber’ simply means ‘Above’ in German. Ever since it started Uber business model has focused on being at the top of the competition and so far they have been successful. How Uber works – They partner with cab drivers to provide cab services which can be booked by customers using the Uber application. The Uber business model and plan started with one city in the USA and now grown to be spread in 633 cities all over the world. In this article we will discuss what is Uber, Uber business model, revenue model and how does it work, what industry is Uber in, Uber management structure, how long has Uber been in business, Uber industry analysis and Uber business strategy. The main reason Uber became the success was that they offered services that no other company in the transportation industry was offering. But it doesn’t matter what industry is Uber in if the services are customer oriented they will reach the top. A user can book cab with just one tap on the Uber app. The drivers have the choice to accept or reject the ride. If a driver accepts the ride, the driver’s information is sent to the rider. Riders can track how many cabs are nearby or in a particular location. 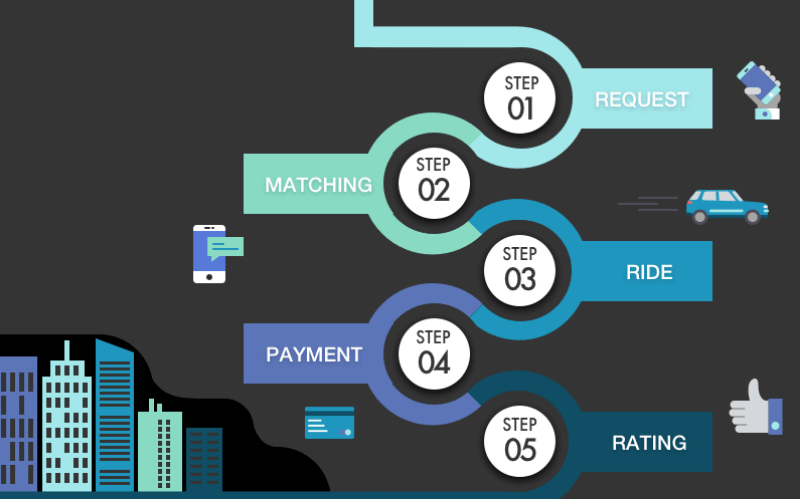 The payment process can be before the ride or after the ride. In some countries like India, cash payment option is also available. The rating, feedback and complain options are all available in the app. The riders or drivers can cancel the ride at any point if needed. It is always debated whether a service was demanded first or supplied first. In simple words, people are unable to decide whether the demand for a service resulted in the supply or the supply of a particular service created its demand. For Uber, it was a clear picture. The Uber business strategy focused on keeping the supply chain fully ready for the time when demand hits. Many startups have taken this strategy for their business following Uber’s footsteps. Whenever Uber enters a city, it gathers drivers on the contract basis so that when the demand for rides come in, they are prepared. Uber business plan revolves around its customers. The priority is giving riders the best experience possible which includes polite drivers, hassle free ride and the ease of booking from anywhere. To do so Uber has to hire drivers and the more the better. Since the Uber business model has light inventory and runs on commission, the only way to keep up with rising demand is having enough drivers to fulfill the demand. People who don’t own a car. People who can’t drive or don’t know how to drive. People who don’t want to drive to functions themselves. Customers who choose luxury travel and VIP treatment. Uber for kids: Uber has come up with this Uber for kids for parents who want their kids to be dropped at home from school. Many parents do not prefer school bus services for personal reasons and Uber saw an opportunity in this case. Uber for senior citizens: Another service Uber offers is Uber for the senior citizen. After learning that 30% of rides are taken senior citizens of a city, Uber decided to launch a special service for them. Uber for professionals: Many employees use Uber to travel to and fro work. It has also collaborated with many companies to provide cab services to the employees of the company. You must be wondering how long has Uber been in business to offer so many services successfully. To answer that question, let’s first understand how Uber gets its customers. After being in business for just 6 years, Uber started being recognized as a brand. When Uber enters a new city, they start working on customer acquisition. First, they add a general manager for the city in the Uber organizational structure who will lead the Uber there. Then they start gathering drivers especially professional drivers who already have a car. After that, they provide the ride to media people and tie up with corporates to provide services to the employees. This way the public comes to know that Uber has come to their city. Now Uber has become a brand and people are probably waiting for it to open in their city. No waiting time to get a taxi. Personal driver means travel in style. Heavy discounts and occasional free rides. Fare comparatively lower than taxi. Fixed fares for certain places like airport, etc. A great source of income. Uber pays drivers for being online. Use your car to earn a little extra. To begin with the funds, in 2009 the founders of Uber investing $200,000 as seed money. 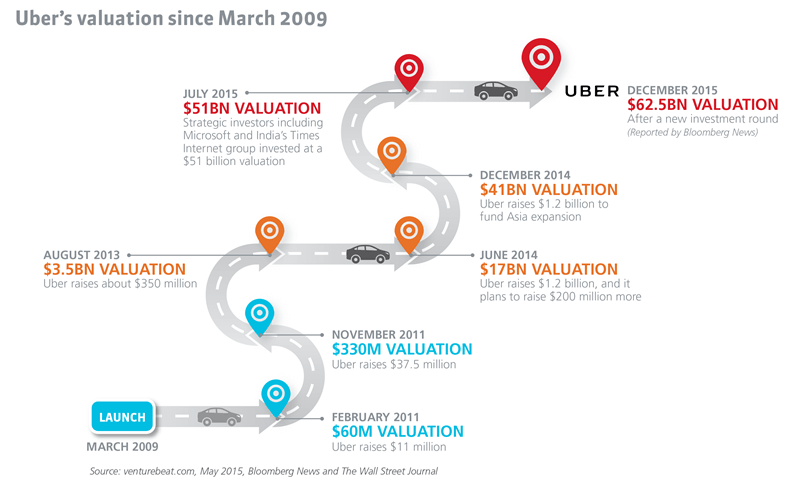 Uber raised $1.25 million by 2010 and by 2011, it raised $44.5 million. A report on Uber financial analysis shows that with the recent funding Uber has reached a valuation of $68 billion (US). Any cab ride ends with rider giving cash to the driver which is the source of revenue and Uber is no different. The Uber revenue model has the same source of income as of now. But then you must be wondering about the big numbers we talked about in the Uber financial analysis section just now? The thing that separates Uber’s revenue from a tradition taxi’s is the number of rides. Uber has added various car models to the fleet: The Uber pricing model for each car depends on the size and level of luxury of the car. From ‘mini rides’ to ‘special SUV rides’, Uber has to offer all at different price ranges. Uber applies price surge technology: When the demand for rides increases, the fare automatically increases. This variation helps Uber in attracting more drivers and generating huge revenues. Other Uber rides: Uber company structure consists of people who are constantly adding new features into the business. The latest rides they have added are boats, helicopters, ice-cream truck delivery, and delivery services. Of course, these are just restricted to geographies for the reason that Uber want to explore as much as it can. Uber application was first built by Garrett Camp and some of his friends. Later the application was developed in order to fulfill the purpose. Back then application development was quite a task but now many mobile app development companies build apps within weeks. The customer needs to open the app and request a ride. This is where the car size is selected (mini, medium or luxury). One the user sends the request, every rider in the range is notified and once a driver accepts the ride, the driver information is sent to the user. The user can track the route with the mobile app and also see the ETA. The meter starts as soon as the ride starts and is stopped after reaching the destination. Once the ride is over the rider has to pay the amount billed to them. The app calculates the prices as per the distance and base fare. How Uber became so Successful? There are many factors that contribute to Uber’s success. This entire article will be incomplete if we don’t conclude by discussing Uber company structure, reasons for success and Uber industry analysis. Uber’s success encouraged many entrepreneurs to copy the Uber organizational structure, business and revenue model. One of the things that contributed the most to Uber’s rise was the dedicated team that was proud of the work they were doing. In every country, a customized Uber management structure was followed. Many businesses built an app just like Uber using location based services which have become like an immediate need in the app development world. Location-based services are going to have a bright future. Making such efforts to come to a level where Uber has reached shows how successful it has become. Uber saw the need and immediately acted upon it, giving no room for others to think. The Uber industry analysis showed that Uber came in the transportation and delivery industry. Uber’s variation in cab services earned them the word of mouth which is said to be one of the best advertising a business can get. “Statistics on the Multi-Billion On-Demand Mobile App Economy,�? 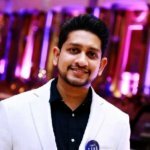 “Starting an On-Demand Business? Know How to Rule the Crowded App Market,�? “How Does Doordash Work - Business Model & Revenue Sources Revealed,�?